I love fresh fish. I select seafood over meat all of the time. This is a nice light meal. I also love working with and eating fresh fish. It is light, just what I wanted to eat! That looks delicious. I think the more simply fish is cooked, the better it tastes. I bet you have some fabulous fish markets where you are! Thanks, I agree - simply cooked fish with a light sauce is perfect! Yes, we have a lot of places to buy fish and we go up to the coast also, to buy fish from the boats (love that sea air!). Looks delicious. Hope to taste it this summer as we hope to visit Normandy for a few days! Thank you, you should look for 'st.Pierre' on the menus, it won't disappoint and nor will Normandy! I hope you have a good time, have you decided which part you plan to visit? If you need any address, just ask. Yum!!! And I definitely can make this dish. Not complicated :) Thanks so much, Ivan!! Thank you, I aim to please! There are some antique fairs in Normandy this weekend and next, that I am going to - you have made me furniture hungry!! I've never heard of this fish, but I know I would like it. Seafood is my meat. It is one that you should try if you ever see it, great taste and texture. We are fish fans also! Saint-Pierre - I wonder why they gave it that name. But then I wonder why we call it John Dory?! Not the most handsome of fish but what it lacks in looks it more than makes up for in taste. The name is from the finger prints on the side (Saint Pierre pulling it out of the water) - The 'John dory' translation I will have to find out... I hope it's not the fisherman who found it!! It is just like a monk fish in challenged looks and more tasty! Yes, I do also - it is a bit scary when I prepare it, I think it may jump out at me! I don't imagine this species ventures too far west in the Atlantic to the shores of Nova Scotia. Looks firmer than Haddock or Cod.....I like the base of rice/carrot as well. It will have to be tried if you get to Europe on a trip! The rice and carrots I cook together in lots of boiling water for 8 minutes drain and let steam a couple of minutes in the pan to finish off cooking. I love my fish kept simple, it would be nice with the rice. Thank you. I am like you, as you really can taste the fish cooking it like this. This looks yummy and I would love to make it. What do you mean by "cidar"? Thanks. Thank you, I use 'apple' cider that we make here (cider is fermented apple juice). It is a dry cider that is not overly sweet, so complements the fish. You could use fish stock and a natural apple juice (but not a lot as it is sweeter). Hope that helps and next time you can leave your name I don't bite!! Pleased to meet you Ed! I am guessing it's Ron, as Aston is so, so quiet when I cook fish! What does Sophie think? SOphie sits and stares and just waits patiently....if a morsel should fall to the floor....slurp down it goes! No question SOphie loves food...the chocolate lab in her me thinks!!! 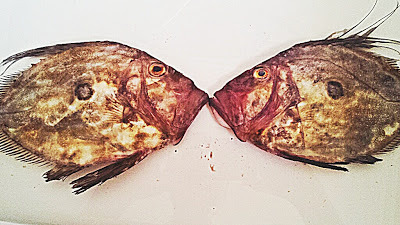 Hi Ivan, I am embarrassed to admit that I know John Dory fish from watching Gordon Ramsey's "Hell's Kitchen!" But now I have a more inspiring chef source in your blog! Doesn't John Dory have a lot of tricksy bones to get out? You make it look so delicious. 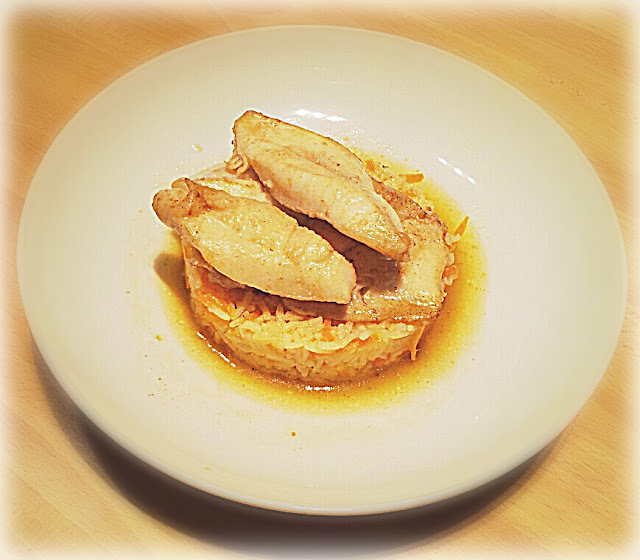 I have a long way to go in the presentation aspects of cooking! Thank you, it's good to watch programs like that and take the information (all kitchens are not like that!!) The JD bones are like most fish (no more than), with only a few side bones that you can tweezer out or even cut away. I think it is hard to keep things hot and look good - speed only come with time (It's good to practice on cold foods first). Have a good week! Thank you, happy you liked it. Have a good week and hope you are having better weather than us here!